The European settlement of Greensborough was from 1839 onward. The Society's aim is to collect, catalogue and preserve the history and heritage of Greensborough and its environs from the earliest records to the present time. 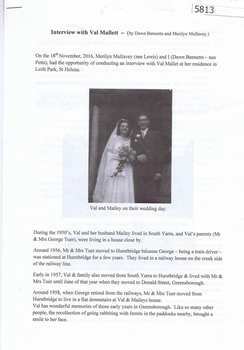 Whilst called Greensborough Historical Society, its coverage is not limited to that area alone and includes Greensborough, Watsonia, Macleod, Montmorency, Briar Hill, Lower Plenty and Bundoora. The Resource Centre at Glenauburn Road Lower Plenty is open every Thursday (10am - 3pm). No charge; membership fees available on website. The Greensborough Historical Society Inc collection focuses on historical and current information relating to Greensborough and surrounding areas, including the former Shire of Diamond Valley. Information is from mid-1840 to the current time. Items include artifacts, photographs, documents, oral histories, maps, school yearbooks and uniforms, books and collected current newspaperr clippings relevant to the area. There is a large digital collection of photographs. 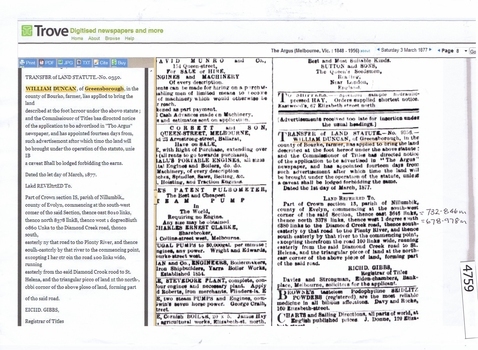 The collection has historical significance in that it brings together information relating to the settlement of Greensborough and district from the mid 1840s. The Greensborough Historical Society Inc was formed in 2010 to collect, preserve and catalogue the history and heritage of the area from earliest records. Hi Greensborough HS, we've really enjoyed the photos you put up over the holidays. They give a wonderful insight into the history of your region. Keep up the good work. VC Admin. Details the payments relating to the management of a billiard room. A collection of advertising relating to the sale of "Ashmead" the former home of the Cordner family in Greensborough. The material relates to the auction of "Ashmead" on 11th August 2012. The house "Ashmead" was built in 1932 and was the home of the Cordner family. 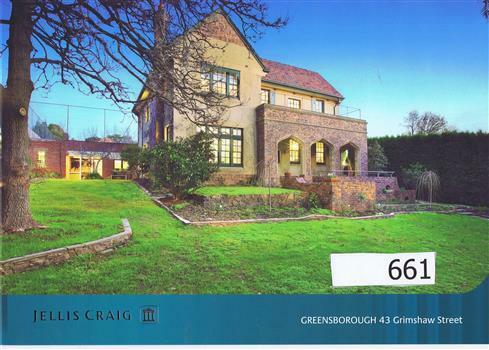 It is one of the better houses in Greensborough and closely resembles an English country manor. Five members of this family played for the Melbourne Football Club. The Maharishi Health Education Centres practised Transcendental Meditation, and had an office in Bundoora on what is now the Loyola College site. A 2 page A3 photoccopy of a real estate advertisement. 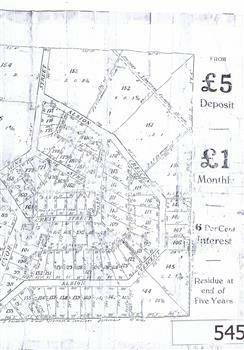 The advertisement was used to sell land in the Greenhills area. The plan included details the original street lay out and names applied to them. It also has dimensions of all the blocks of land available and locations and dimensions of easements. 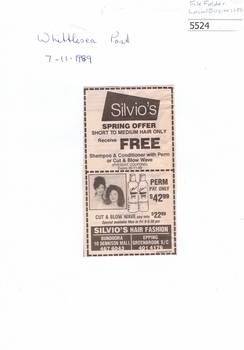 Advertisement for Silvio's Hair Fashion; 8 Dennison Mall; Bundoora and Epping. 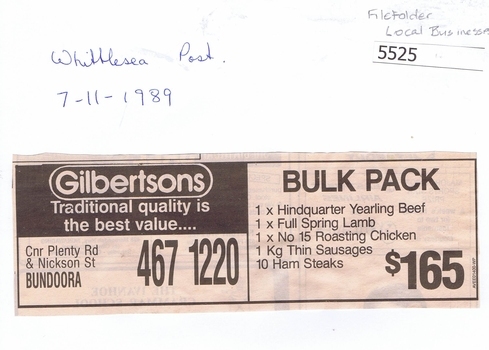 Advertisement for Gilbertsons [butchers] of Bundoora. 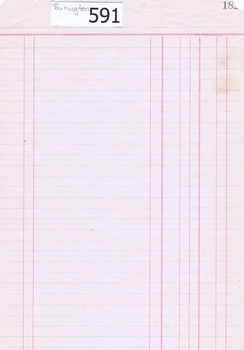 2 pages from a Victorian Railways travel journal. Advertisement for Greensborough Hotel 1933-34. Photocopy from original journal. 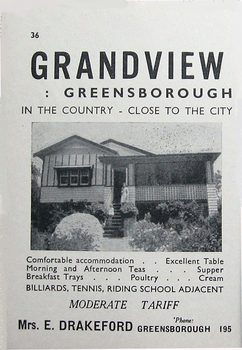 An advertisement for Greensborough Hotel in the town of "Greensborough, picturesque township on the Plenty River, 13 miles from Melbourne." Photograph show the "new brick building with all modern conveniences'. Greensborough in the 1930s was a popular spot for picnics and holidays. A 1 page multi coloured Real Estate advertisement. This advert appear in the Weekly Review on 22/08/2012. 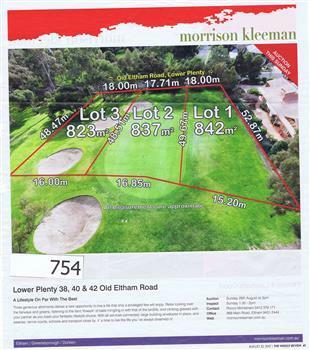 It features the sale of 38, 40 & 42 Old Eltham Rd, Lower Plenty in 2012. Land borders Heidelberg Golf Club. 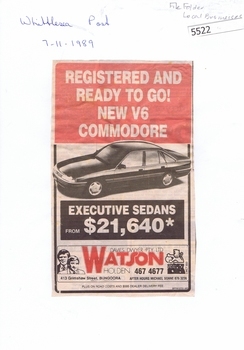 Advertisement for Watson Holden (Davies Dwyer Pty Ltd) of Grimshaw Street, Bundoora. 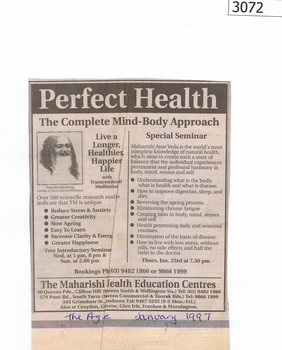 Digital copy of newspaper advertisement. 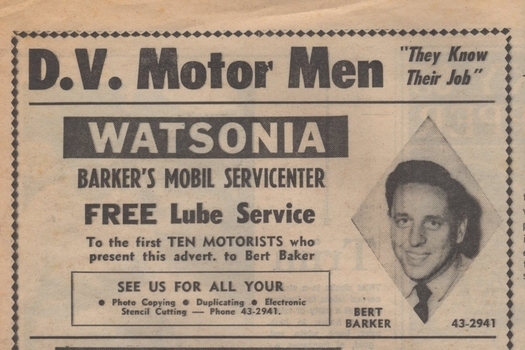 These advertisements were collected from the Diamond Valley Local newspaper. The Stubley group of companies operated several businesses in Greensborough. 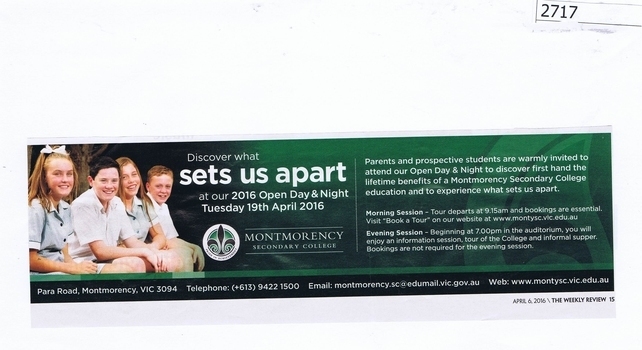 This advertisement is for a Greensborough based shop which no longer operates. Advertisement - Digital image - 23 Mayfield Street Greensborough,1979. Digital copy of black and white real estate advertisement. 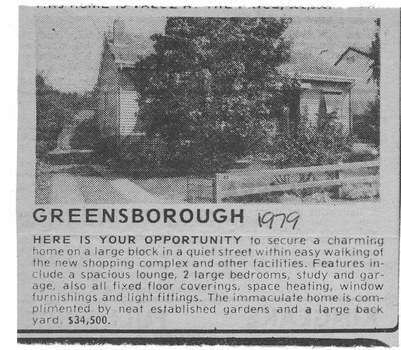 This 1979 advertisement is for the sale of a house at 23 Mayfield Street Greensborough. 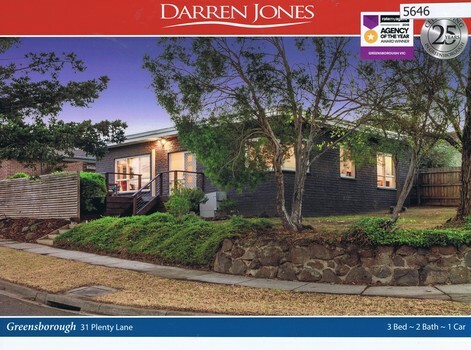 Contains description and price of house. 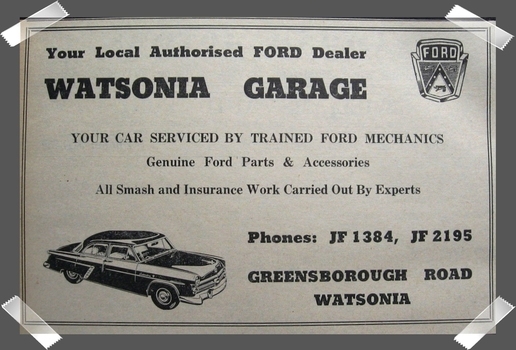 The Watsonia Garage was located on Greensborough Road Watsonia and was a Ford dealership. This advertisement is from the 1960s. Links: 03844:03968 Digital copy of colour photograph and notes. "Grandview" was the name of Mrs Drakeford's Boarding House in Greenhill Road Greensborough. This photograph shows the house in 2016. Includes notes on the history of the house. These advertisements were found in a suitcase donated by a GHS member. The case contained newspapers and other items. 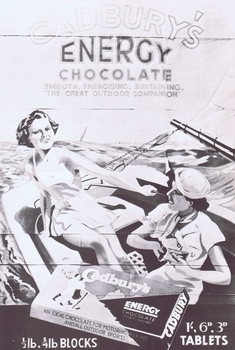 This advertisement is for Cadbury Energy Chocolate. 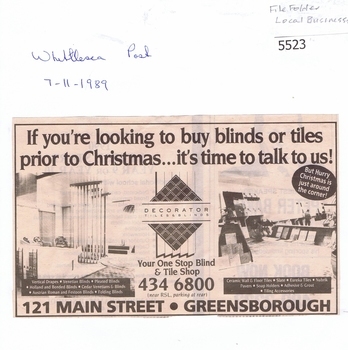 Although the advertisement not Greensborough based, it came from a local home. These advertisements were collected from a local newspaper. These are notices to variations in rail services. These advertisements were found in a suitcase donated by a GHS member. The case contained newspapers and other items. 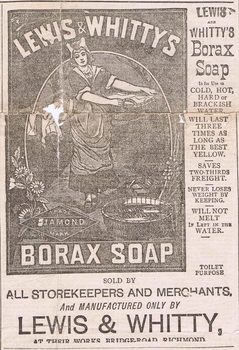 This advertisement is for Borax Soap manufactured by Lewis and Whitty in Richmond. These advertisements were found in a suitcase donated by a GHS member. The case contained newspapers and other items. 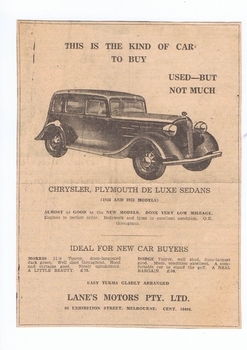 This advertisement for Lane's Motors in Exhibition Street Melbourne is from 1935. 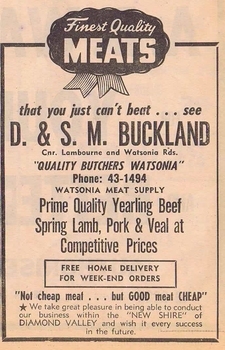 Advertisement for Buckland Butchers, Watsonia Meat Supply, Corner Lambourn and Watsonia Roads, Watsonia. These advertisements were found in a suitcase donated by GHS member. The case contained newspapers and other items. This advertisement is from the 1960s. These advertisements were found in a suitcase donated by a GHS member. The case contained newspapers and other items. This advertisement for Robia fabric and depicts an elegant image of a completed dress. Links: 03844:03968 Digital copy of black and white advertisement. 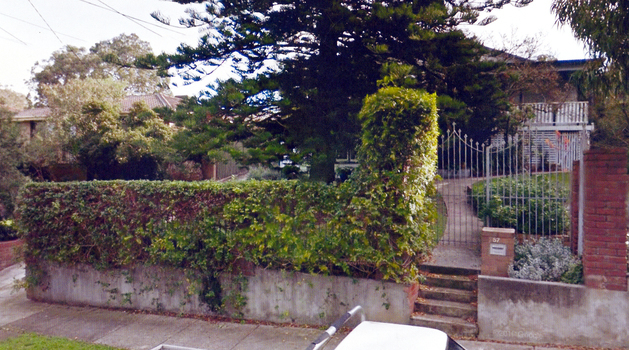 "Grandview" was the name of Mrs Drakeford's Boarding House at 57 Greenhill Road Greensborough. This advertisement is from the 1940s. 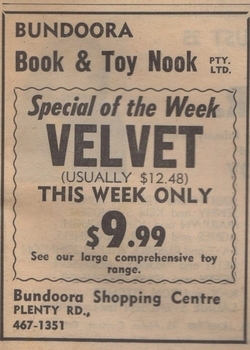 Advertisement for Bundoora Book and Toy Nook, Bundoora Shopping Centre, Plenty Road, 1973. Advertisement for Bundoora Nurseries, corner Plenty Road and McLeans Road Bundoora, 1974. 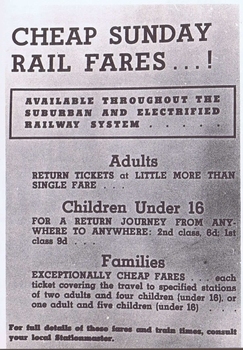 Digital copy of public advertisement reproduced from TROVE 1 page. 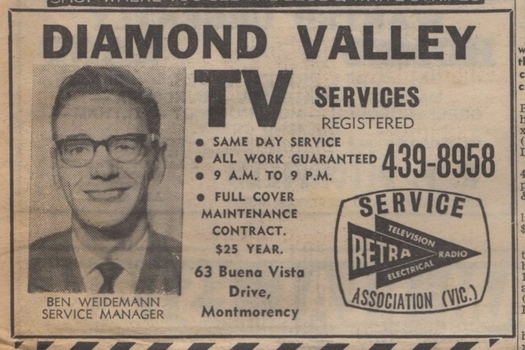 Advertisement for Diamond Valley TV Services, 63 Buena Vista Drive Montmorency, 1970.